The venue today was the West & North course at Plutaluang and after a quick check-in we were off the North 1 half an hour early in sunny conditions with a cooling breeze. The course was in very good shape with some of the greens being especially quick. Tom Cotton (left) with Lawrece Lee. We had a speedy round of just 4 hours and back in the clubhouse a welcome went out to Brian Parish who playing with us for the first time. 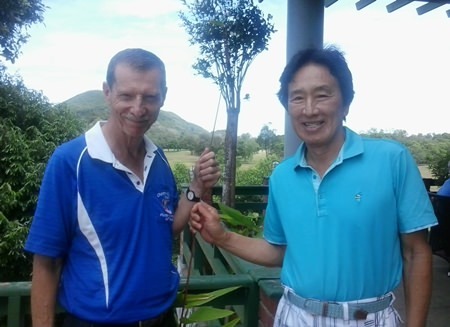 Two flights today with the cut at 21 and Lawrence Lee took the top division honours with a one over par 35 points. Daryl Evans claimed the runner-up spot just a point back of Lawrence and Andre Vandyk placed third with 32. Tom Cotton returned the best score of the day (37pts) to win the B Flight and he was followed up the podium steps by Hugh O’Donnell and Steen Habersaat.